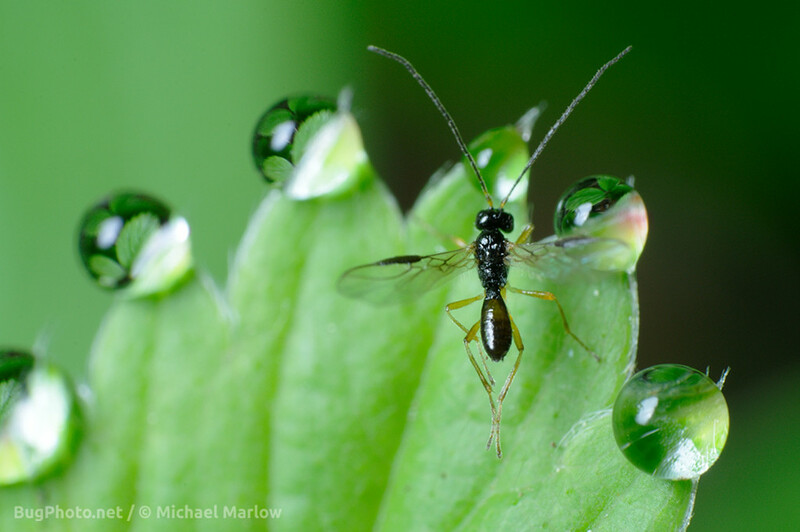 Caught among a field of mirrors: a small parasitioid wasp rests on a dew drop-covered strawberry leaf. This subject was both exciting and (ultimately) disappointing. I just couldn’t get a good angle of the wasp and the dew drops with both in focus. I had a better shot of the wasp (which was very small, eyeball guess says not more than 4mm from head to abdomen) with its wings closed but fully in focus (more or less! ), but I didn’t like the overall composition as much; maybe I’ll add it later but not wanting to at the moment. Still I think the scene is cool and worth sharing; the group of three leaves on the wild strawberry plant had dew drops on every single point (I also missed a clean shot of the complete set of dew drops trying to get the higher magnification shots of the wasp; once it flew off I zoomed out and a few of the drops had run from their points — apparently bugs AND dew won’t keep still for a macro photographer!). Anyway, from the backyard, strawberry leaves, for a moment. Posted in WaspsTagged leaves, Macro Photography, parasitoid, refraction, reverse lens, strawberryBookmark the permalink.